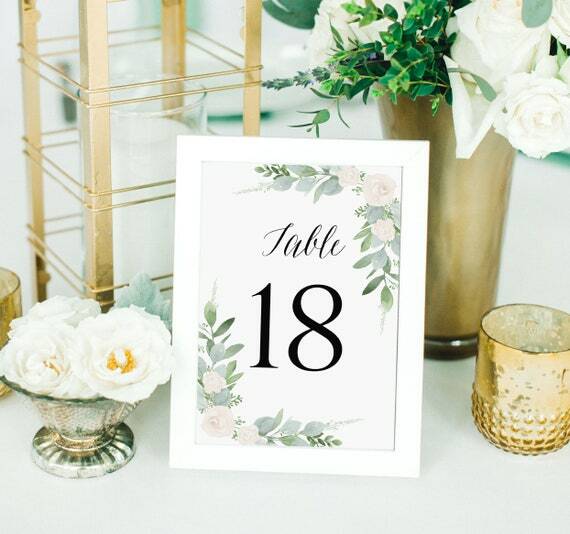 Print your own beautiful wedding or event table numbers with this template. These table numbers are easy to edit using our design application right in your browser. Just edit any of the text for your wedding or event, and print them out on any card stock paper of your choice. You don't need and software or special fonts installed. Check out this template and others in our demo area and play around with it before you purchase! You will receive an email from Templett.com immediately after purchase with the link to your editable templates. You will not receive anything in the mail (No Waiting - Instant Editing!). 1. Open file using our design application right in your browser. 2. Edit text and colors, move object around, etc. 3. Print on any card stock paper and cut on trim lines. You will receive templates in which you can create as many table numbers as you need. Plus, four Reserved Sign templates. You can print these table numbers on any 8.5" x 11" card stock paper of your choice. We recommend a nice heavy card stock for highest quality feel. If you are framing them you can print an any weight card stock. You can print these right on your own printer or have them printed at Staples®. Office Max®, Office Depot® or any other professional print shop that accepts PDF files. The colors you see on your computer screen may print slightly different on paper. Test print one page first. You may use this file for your own PERSONAL USE ONLY. File sharing, distribution, and commercial use of this file or of the printed work from this file are prohibited. 1. Purchase the template (no need to download any files!). 3. Make all your changes to the template, Save, and Download the PDF. You can save your files and come back to our web app at any time and continue editing your template. It will always be available to you. Enjoy!